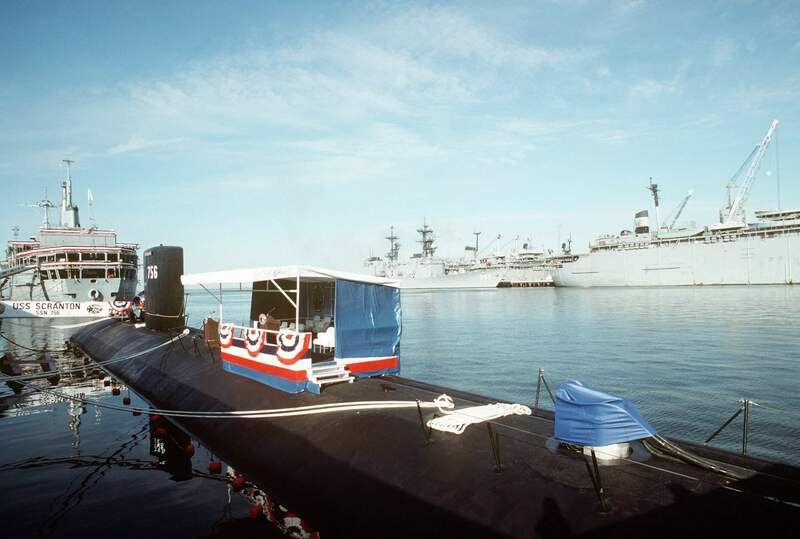 Los Angeles Class (Improved) Attack Submarine: Laid down, 28 August 1986, at Newport News Shipbuilding and Drydock Co., Newport News, VA.; Launched, 3 July 1989; Commissioned, USS Scranton (SSN-756), 26 January 1991. 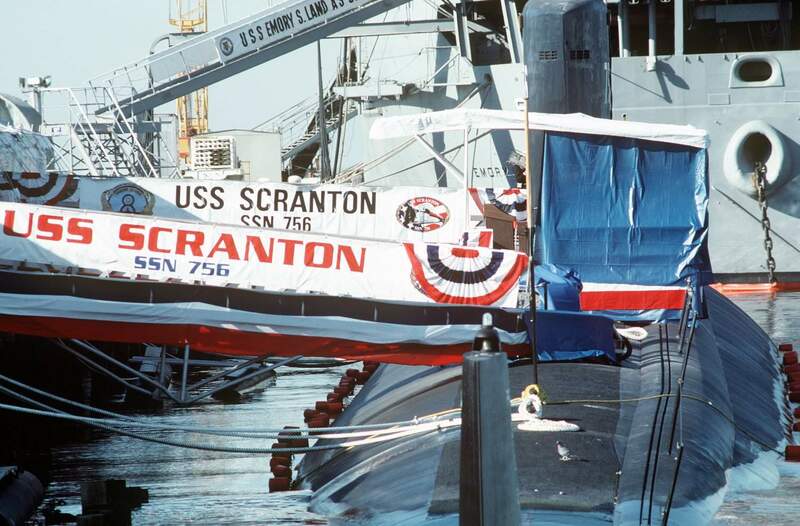 Scranton is assigned to the US Atlantic Fleet and is homeported at Norfolk, VA.
114k Christening program for the Los Angeles-class fast attack submarine Scranton (SSN-756), 15 April 1989. USN photo courtesy of Robert M. Cieri. 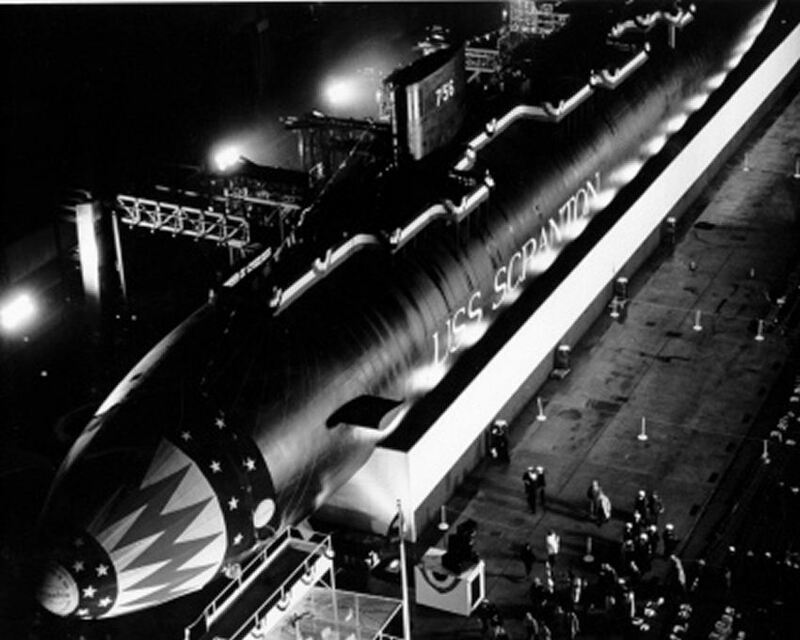 84k Night time at Newport News Shipbuilding and Drydock Co., Newport News, VA. at the christening ceremony of the U.S. Navy submarine Scranton (SSN-756), 15 April 1989. USN / USNI photo. 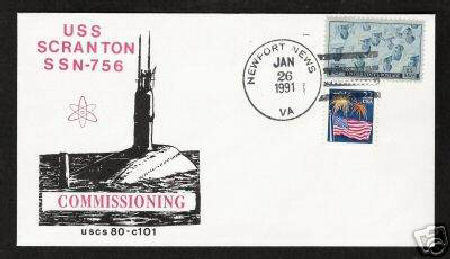 27k Commemorative postal cover issued on the occasion of the Scranton's (SSN-756) commissioning, 26 January 1991. Courtesy of Jack Treutle (of blessed memory). 49k Scranton (SSN-756) on sea trials, 19 December 1990 off Newport News, VA. Photo by Mike Dillard, courtesy of General Dynamics Electric Boat. 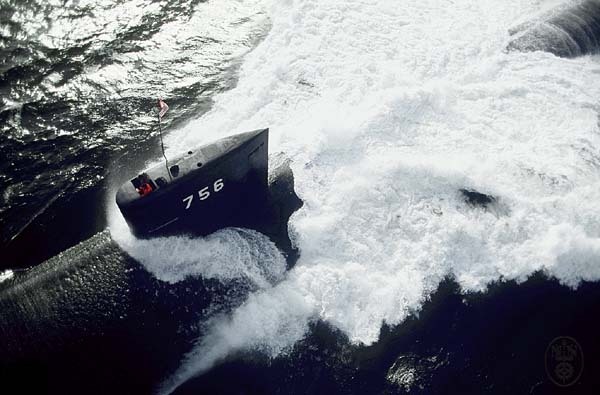 42k Bow on view of the Scranton (SSN-756) on sea trials, 19 December 1990 off Newport News, VA. Photo by Caroline Frantz, courtesy of General Dynamics Electric Boat. 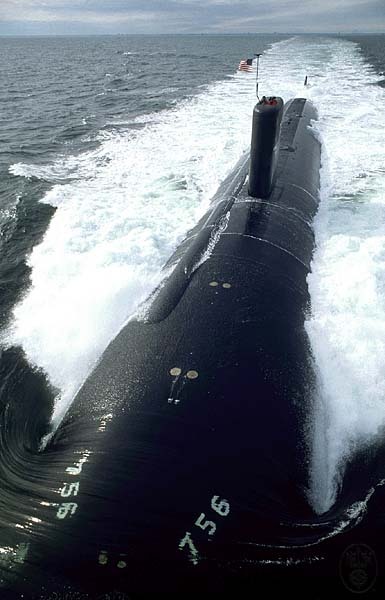 231k A starboard quarter view of the nuclear-powered attack submarine Scranton (SSN-756) underway during sea trials off the Virginia Capes on 19 December 1990. Official USN photo # DN-SC-94-01495, by Caroline Kiehner, from the Department of Defense Still Media Collection, courtesy of dodmedia.osd.mil. & submitted by Bill Gonyo. 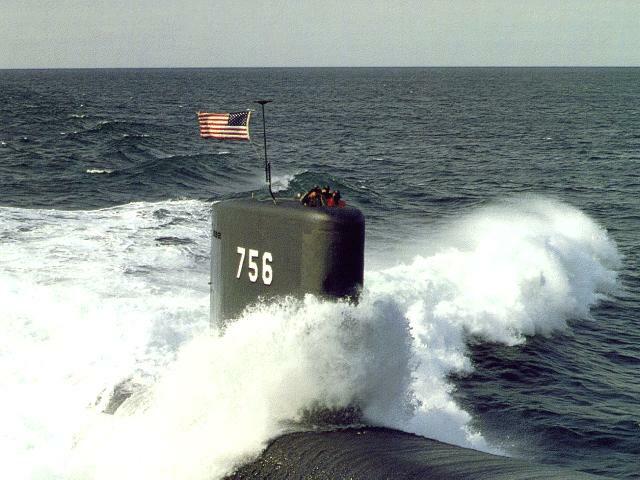 51k Scranton (SSN-756) starboard sail view with a stiff breeze showing the colors, possibly while on sea trials, 19 December 1990 off Newport News, VA. Courtesy of globalsecurity.org. 165k The speakers platform stands atop the nuclear-powered attack submarine Scranton (SSN-756) in preparation for the vessel's commissioning ceremony on 26 January 1991. Official USN photo # DN-ST-91-05158, by JO3 Monica L. Miles, from the Department of Defense Still Media Collection, courtesy of dodmedia.osd.mil. & submitted by Bill Gonyo. 186k Banners decorate the brow of the nuclear-powered attack submarine Scranton (SSN-756) in preparation for the vessel's commissioning ceremony. Official USN photo # DN-ST-91-05159, by JO3 Monica L. Miles, from the Department of Defense Still Media Collection, courtesy of dodmedia.osd.mil. & submitted by Bill Gonyo. 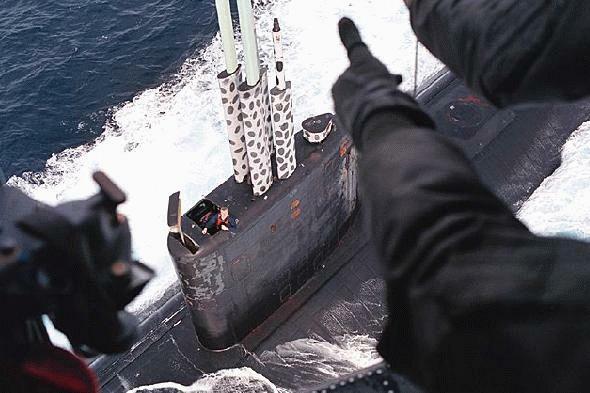 41k A crewmember on board the submarine Scranton (SSN-756) stands by for an at-sea mail delivery from an SH-60 Seahawk from Helicopter Anti-Submarine Squadron FIVE (HS-5), the "Nightdippers", 22 February 1996. The units are operating in support of Operation Joint Endeavor. USN photo # N-7340V-003 by Photographer's Mate 2nd Class Jim Vidrine, courtesy of chinfo.navy.mil. 111k Scranton (SSN-756) doing an emergency blow for "effect" as seen from the deck of the George Washington (CVN-73) in the Persian Gulf, May 1996. Photo courtesy of Wendell McLaughlin. 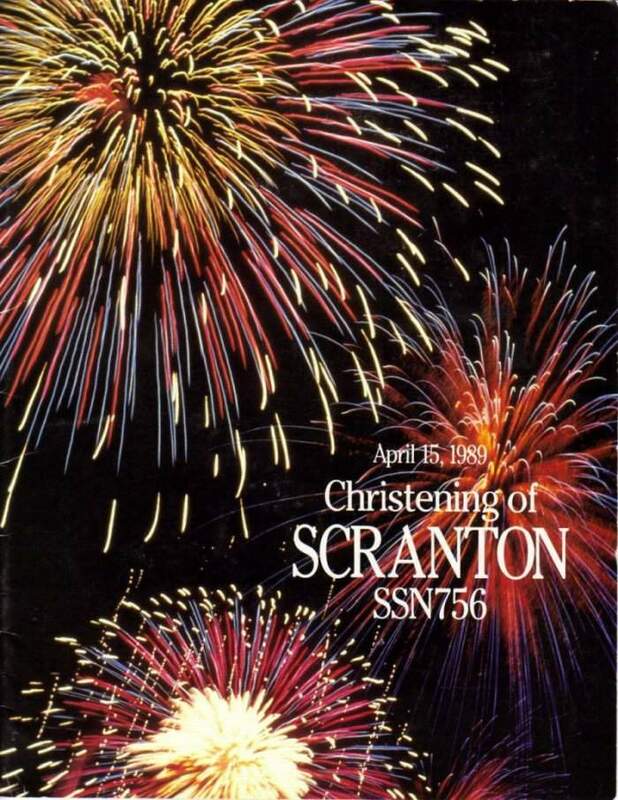 857k Fourteen page Welcome Aboard the Scranton (SSN-756) PDF. USN photo courtesy of Scott Koen & ussnewyork.com. 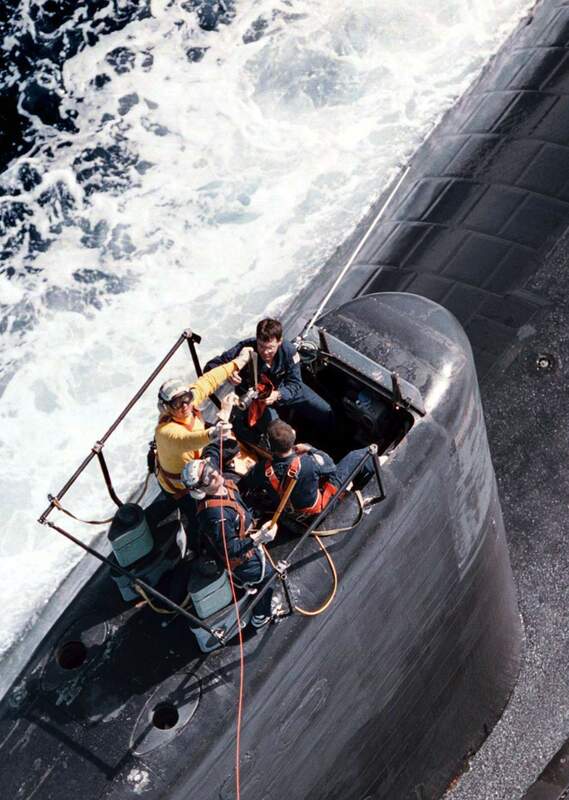 171k Sailors on board the nuclear powered attack submarine Scranton (SSN-756) receive a mail package lowered from a SH-60 "Seahawk" helicopter from Anti-Submarine Squadron Five (HS-5) during operations in the Atlantic Ocean, 17 July 1996. The Scranton is part of the aircraft carrier George Washington (CVN-73) Battle Group, which is just days away from completing their scheduled six-month deployment in the Mediterranean. The George Washington will be returning to homeport, 23rd July after completing a scheduled six-month deployment to the Mediterranean, which included sustained operations in support of the NATO-led peacekeeping in Bosnia and UN sanctions against Iraq in the Arabian Gulf. USN photo # N-2381V-006 by Photographer's Mate 3rd Class Chris Vickers, courtesy of chinfo.navy.mil. 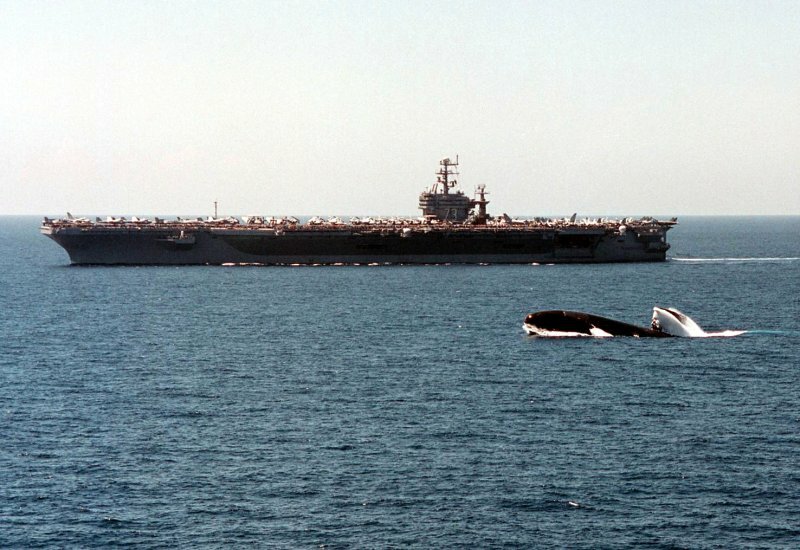 99k The attack submarine Scranton (SSN-756) surfaces in the North Arabian Sea while the aircraft carrier George Washington(CVN-73) cruises in the background on 9 May 1996. 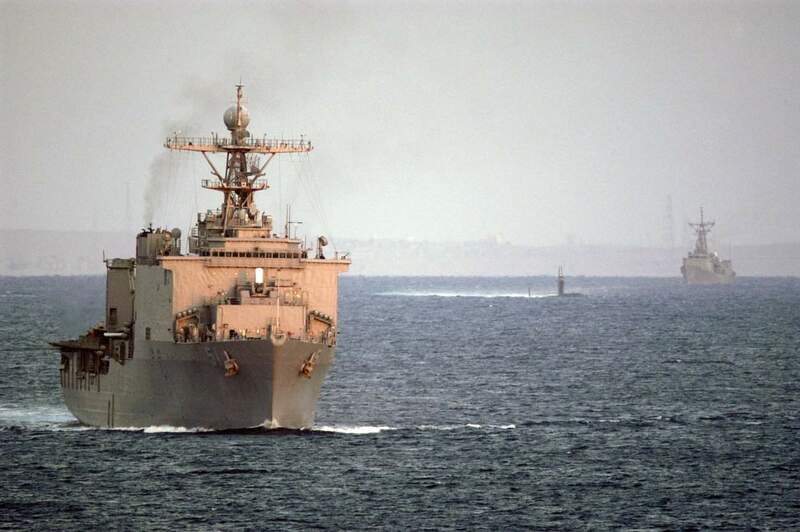 The George Washington and her battle group were operating in the Persian Gulf where they conducted air patrols in support of Operation Southern Watch, the U.S. and coalition enforcement of the no-fly-zone over Southern Iraq. DoD photo # N-7340V-001 by Petty Officer 2nd Class Jim Vidrine. Courtesy of Fabio Pena. 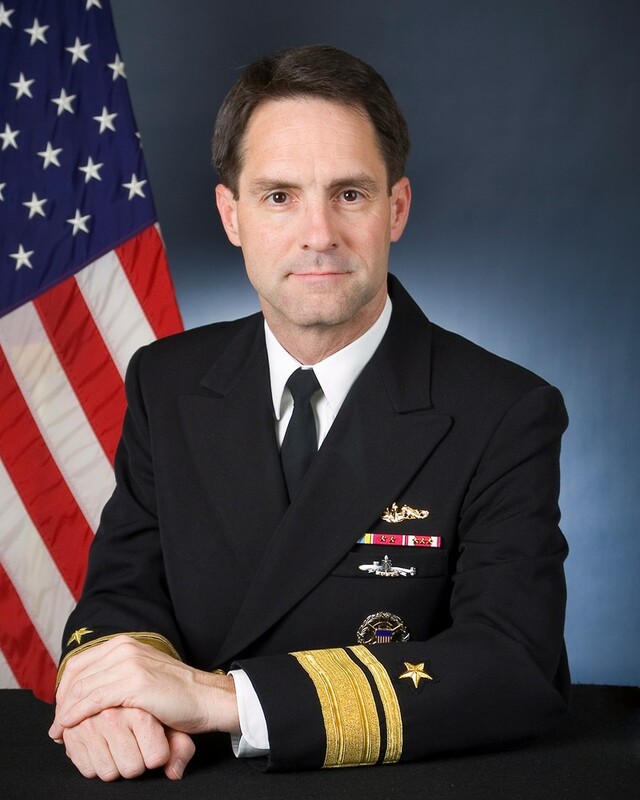 147k As a career submarine officer, Vice Adm. Bird has served on both fast attack and ballistic missile submarines in both the Pacific and Atlantic Fleets. 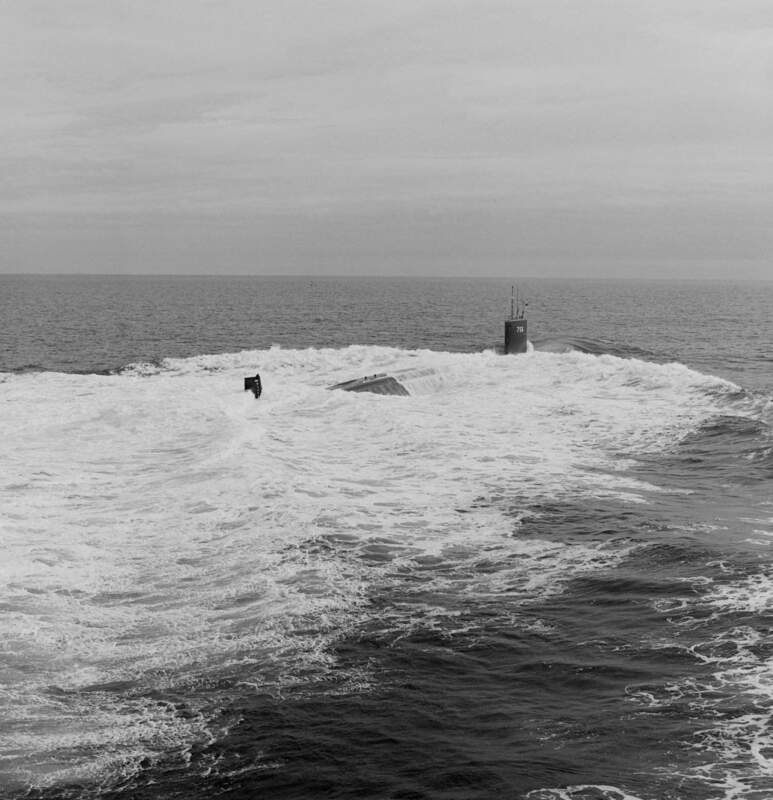 His assignments included, Seahorse (SSN-669), Simon Bolivar (SSBN-641), Sea Devil (SSN-664), Tunny (SSN-682), and Scranton (SSN-756) where he served as the commanding officer and was awarded the Naval Submarine League's Jack Darby Award for Inspirational Leadership and Excellence in Command, and earned the Submarine Squadron 6 (CSS-6) Battle Efficiency "E" for two consecutive years in 1994 and 1995. He commanded CSS-8 which included eight fast attack submarines in Norfolk, from August 1999 to April 2001. USN photo courtesy of cpf.navy.mil/bios/deputy. Photo courtesy of Bill Gonyo. 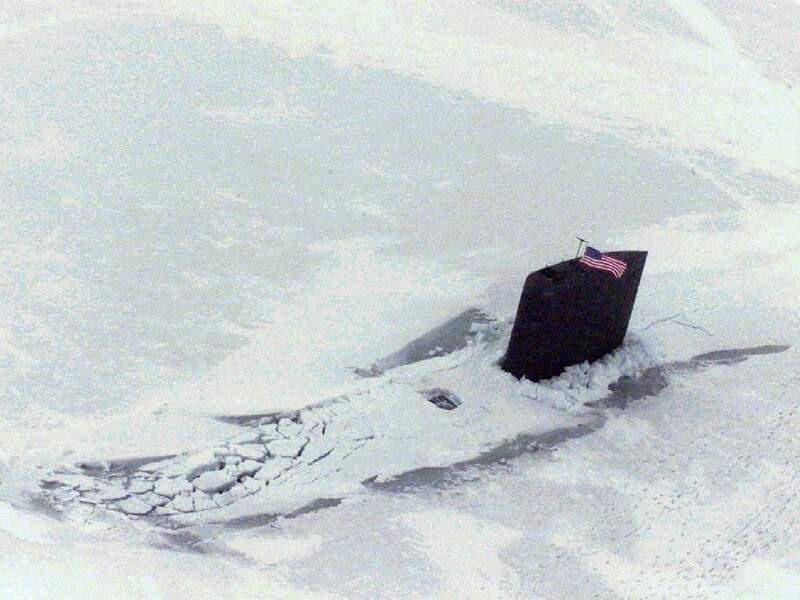 81k The fast attack submarine Scranton (SSN-756) breaks through the Arctic ice at the North Pole, 5 June 2001. 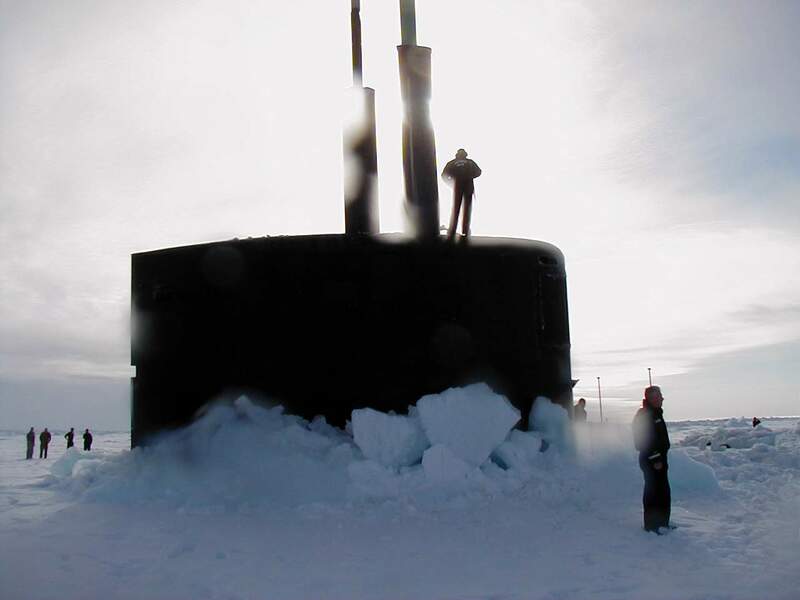 For the first time in a third of a century, Scranton was one of two U.S. submarines to surface at the North Pole. Scranton and her crew broke through almost four feet of ice as a part of Atlantic Submarine Ice Exercise (LANTSUBICEX) 1-01, a three-ship exercise which demonstrated the U.S. Navy's commitment to assure access to all international waters. USN photo # N-0000X-004, courtesy of news.navy.mil. 52k Sailors stationed aboard the fast attack submarine Scranton (SSN-756) are silhouetted by the Arctic sun. USN photo # N-0000X-001, courtesy of news.navy.mil. 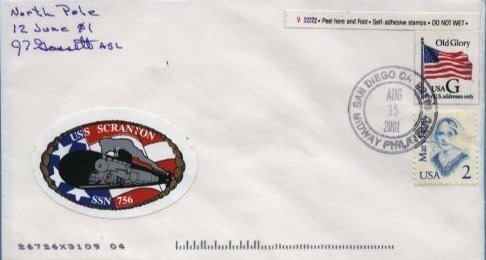 25k Commemorative postal cover issued on the occasion of the Scranton's (SSN-756) visit to the North Pole, 15 August 2001. Courtesy of Jack Treutle (of blessed memory). 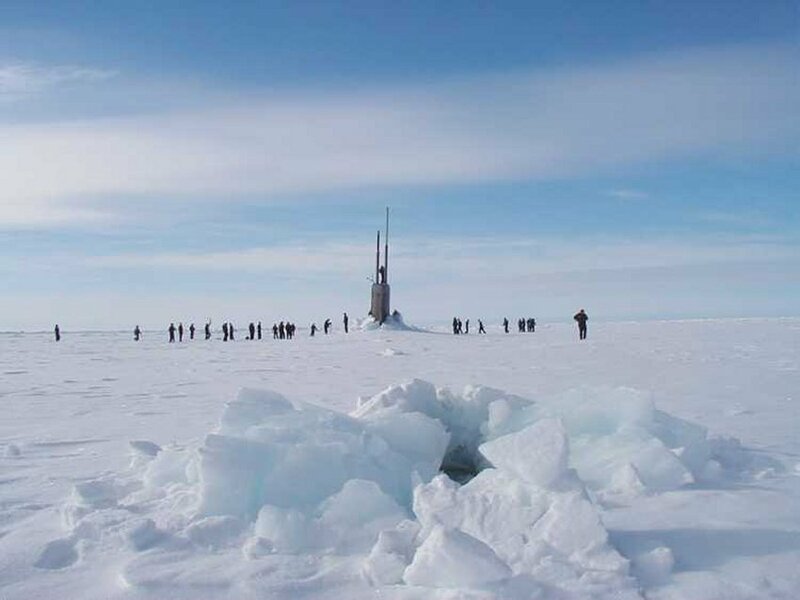 49k The crew of the Scranton (SSN-756) fan out across the Arctic ice on her visit to the North Pole, 15 August 2001. USN photo courtesy of US Navy Arctic Submarine Laboratory & csp.navy.mil. 105k Forward VLS tubes of the Scranton (SSN-756) open for inspection while the boat was docked at Naval Station Norfolk VA, 10 September 2004. USN photo courtesy of Wendell McLaughlin. 44k Driver of the Navy sponsored NASCAR Busch Series No. 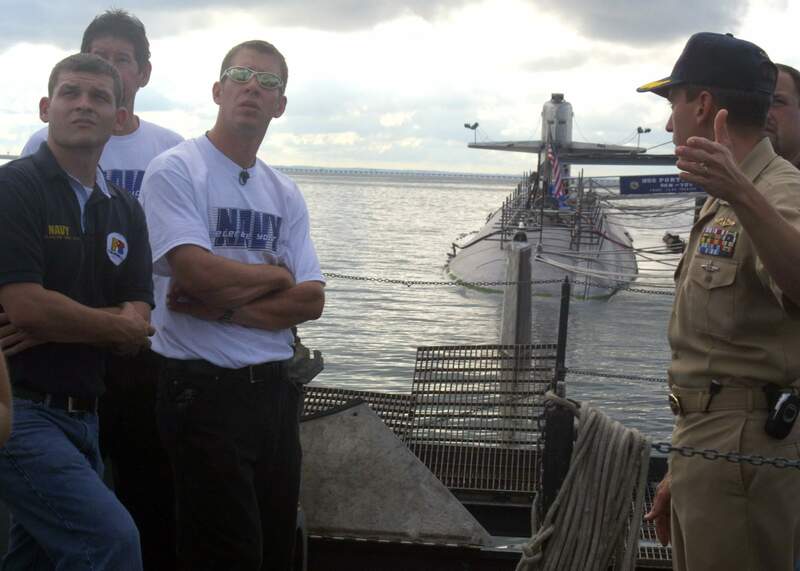 14 Chevrolet Monte Carlo, Casey Atwood and members of his crew check out the sail onboard the submarine Scranton (SSN-756). The FitzBradshaw race team visited Naval Station Norfolk, 15 - 17 September 2004, to tour the base and get a glimpse of what Navy life is like for the Sailors they represent weekly. 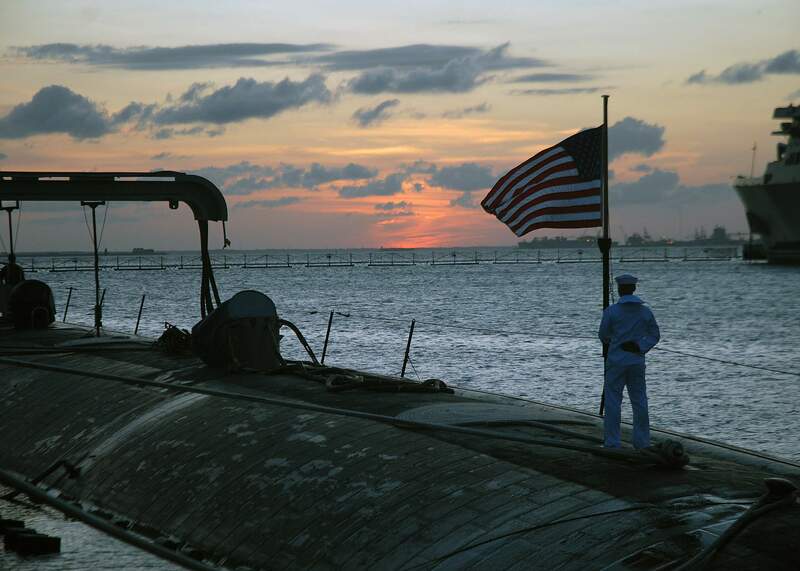 The Portsmouth (SSN-707) is docked behind them. USN photo # N-2820Z-001 by Journalist Apprentice Andy Zask, courtesy of chinfo.navy.mil. 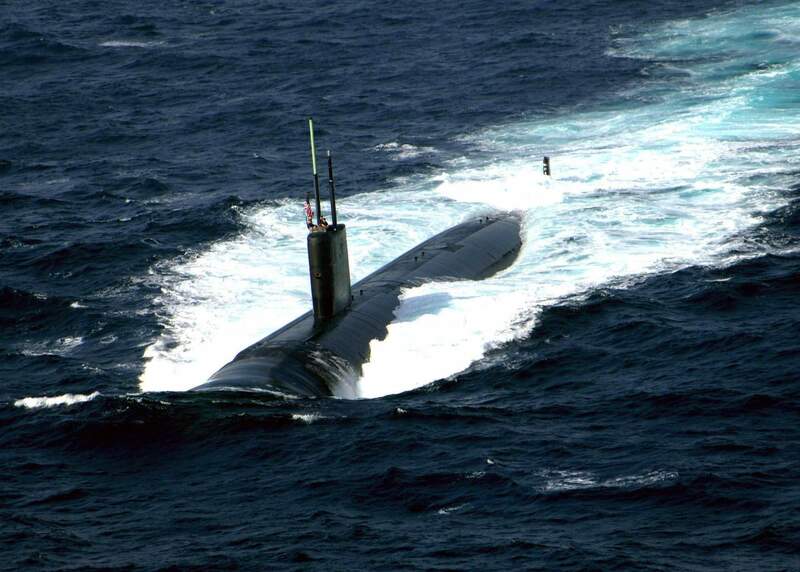 267k The fast-attack submarine Scranton (SSN-756) underway while participating in Operation Inspired Siren. USN photo # N-5526M-002 by Photographer's Mate 1st Class Robert R. McRill, courtesy of chinfo.navy.mil. 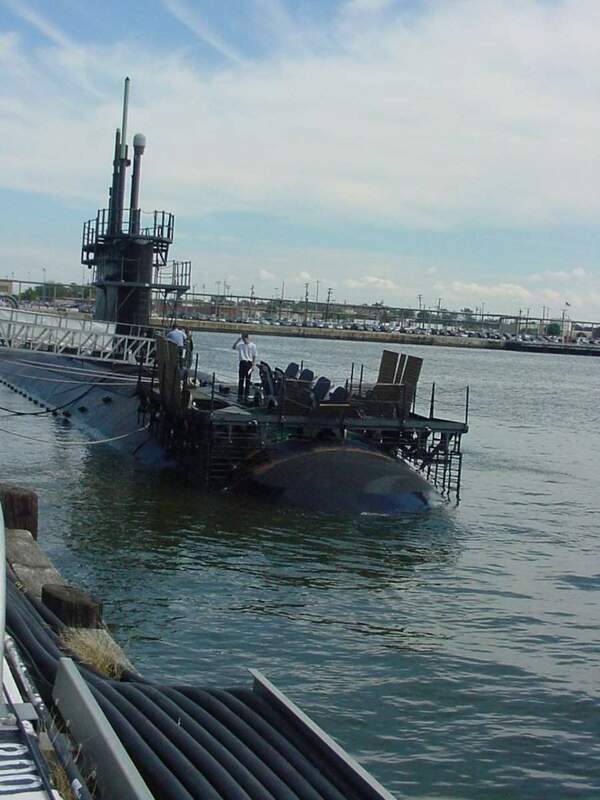 457k The Los Angeles-class fast attack submarine Newport News (SSN-750) render honors to Scranton (SSN-756) as it returns to Naval Station Norfolk on 27 September 2005 after a regularly scheduled deployment. Scranton deployed in support of the Kearsarge Expeditionary Strike Group (ESG), participating in two joint/multi-national exercises. USN photo # N-3312P-004 by Chief Journalist Mark O. Piggott, courtesy of news.navy.mil. 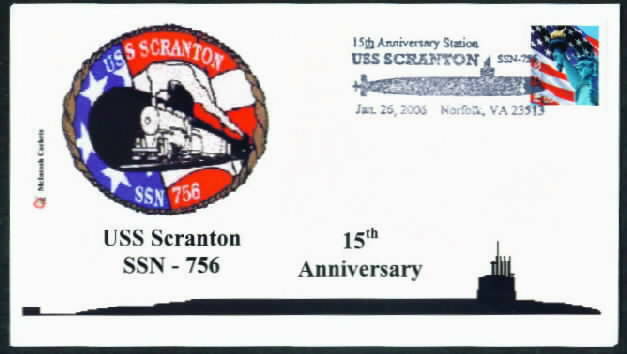 24k Commemorative postal cover marking the Scranton's (SSN-756) 15th year of service since her commissioning, 26 January 2006. Courtesy of Jack Treutle (of blessed memory). 109k Dock landing ship Oak Hill (LSD-51), fast attack submarine Scranton (SSN-756) and guided missile frigate Underwood (FFG-36) transit the Gulf of Suez, after completing the passage of the Suez Canal on 31 January 2007. The ships are part of the Bataan Expeditionary Strike Group (ESG), which is comprised of Bataan Strike Group and the 26th Marine Expeditionary Unit (MEU) based out of Camp Lejeune, N.C. USN photo # N-8154G-028 by Mass Communication 2nd Class Jeremy L. Grisham, courtesy of news.navy.mil. 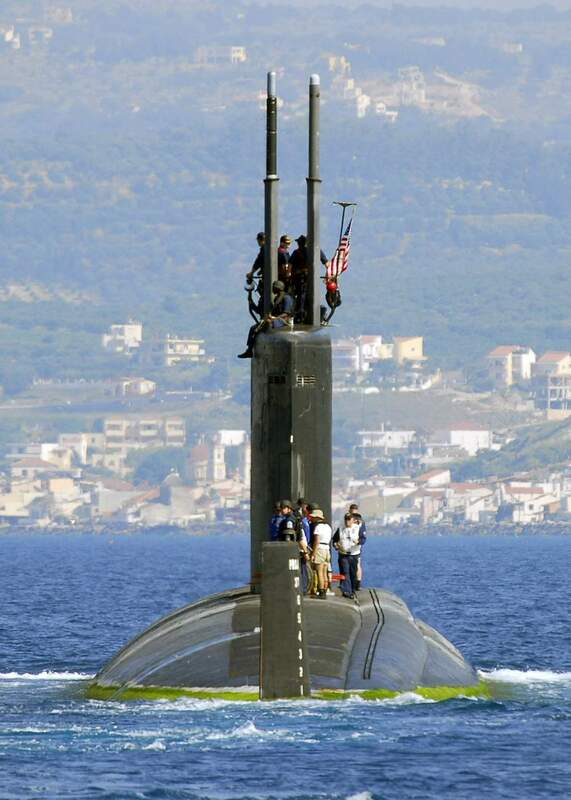 186k The submarine Scranton (SSN-756) departs Souda harbor following a routine port visit to Greece's largest island on 15 June 2007. USN photo # N-0780F-003 by Mr. Paul Farley, courtesy of news.navy.mil. 426k Chief Electronics Technician (SS) William Hoyt reaches under the chart table aboard the fast-attack submarine Scranton (SSN-756) and pulls out a black nylon compact disc case the size of a phone book. “That’s the whole world,” says the ship’s assistant navigator, holding it up. Rather than containing the latest in heavy metal or rap, it holds 29 discs of the globe’s nautical charts as part of the ship’s electronic Voyage Management System, or VMS. Moving quietly through the dark depths, submariners have long relied on maintaining an accurate location and course provided by a navigation team stooped over large paper charts. And until recently, Scranton might have had 5,000 such charts stashed in lockers around the ship. Instead, the crew will rely on the discs and VMS on its upcoming deployment, as the Navy’s undersea fleet sheds its paper charts. 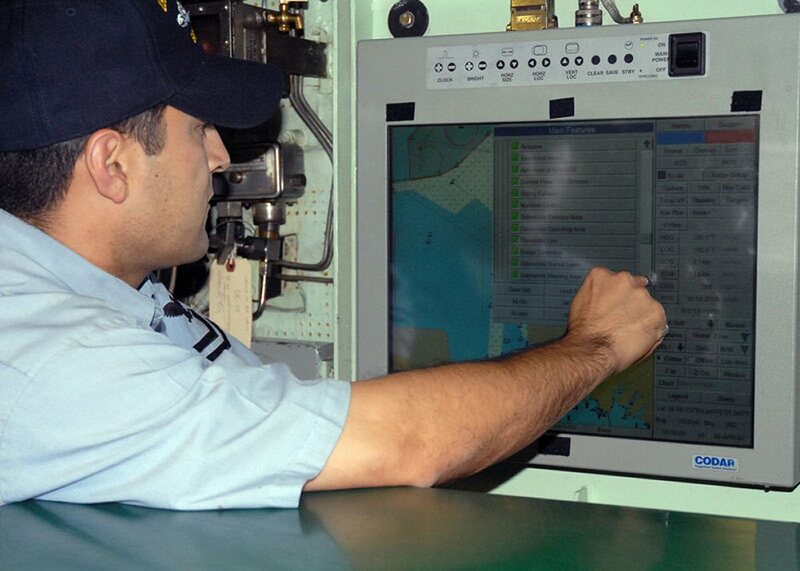 And while submariners may groan at the thought of giving up their reliable, tangible paper charts, the undersea fleet is on a steady course to switch completely to electronic navigation. Scranton's navigation team was certified in August and on its upcoming deployment will only use paper charts for large-scale planning purposes. Benke, who took his current job in July, said there were about 10 crews certified at the time. Today, all eight blue and gold crews for guided missile subs are certified, as are 25 crews in the attack submarine fleet. Oklahoma City (SSN-723) was the first to certify, in October 2006. Likewise, the Navy’s 14 Ohio-class (SSBN-726/43) ballistic missile submarines will begin certifying in 2009, with the process taking about four years to complete. And as current crews make the shift and get certified, the Navy’s newest submarines will be going to sea essentially paperless. Benke said the New Hampshire, SSN-778) a Virginia-class submarine commissioned October 25, went through its builder’s trials equipped solely with digital navigation. “That’s a big transition,” he said. Some recent mishaps have highlighted the need for extremely precise navigation. Inaccurate charts were blamed after the attack submarine San Francisco (SSN-711) plowed into an underground mountain 350 miles south of Guam on 8 January 2005, partially crushing the bow and killing one sailor and injuring 31 others. 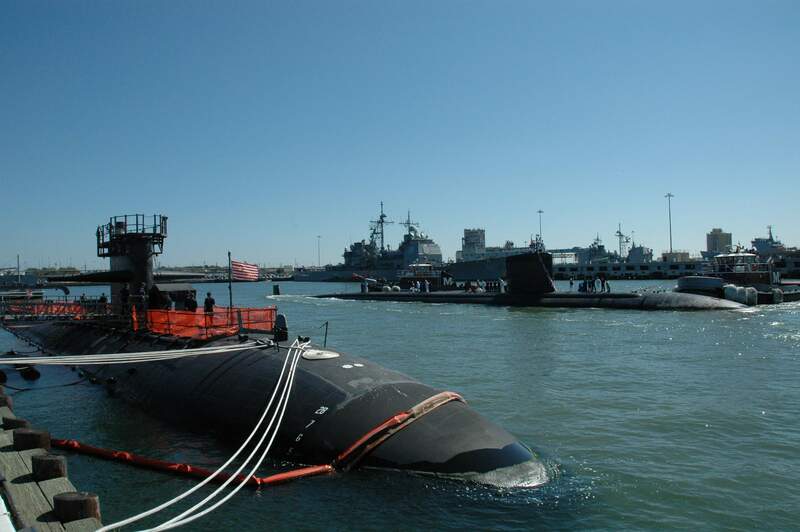 Likewise, an investigation into the grounding of the attack submarine Hartford (SSN-768) on 25 October 2003, on a reef off La Maddalena, Italy, during a surface cruise found faulty navigation as a cause. For Scranton's navigation team, working electronically means being able to navigate the sub to where it’s going instead of plotting where they think they’ve been. The VMS contains multiple layers of charts — rather than a single paper chart — that can be updated continuously. When the sub is submerged, its course is constantly tracked on VMS from the Ring Laser Gyro Navigation system. “It makes the process of trying to figure out where you need to be much faster,” Hoyt said. “Instead of looking behind you, this is all real-time data.” To track surface contacts, information identifying commercial ships can be fed into VMS through the fire control system, further clarifying potential hazards. Likewise, fresh charts can be downloaded when the ship is in port or when new discs arrive. Hoyt said the system is also an incredible time saver because a recently returned crew can hand over the discs from its deployment to an outgoing crew. While the Scranton navigation team said it looks forward to electronically navigating in its upcoming deployment, they’re also looking toward the next development, such as the current touch-screen version improved with a tabbed format. “There’s always room to improve technology,” Hoyt said. USN photo by MCSN Kelvin Edwards, courtesy of navytimes.com. Text courtesy of Andrew Scutro via Ron Reeves (of blessed memory). 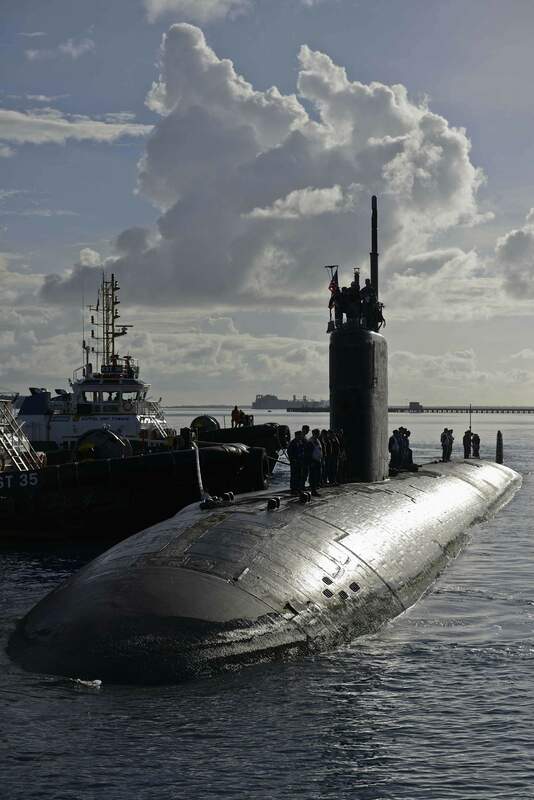 814k The fast-attack submarine Scranton (SSN-756) pulls into U.S. Navy Support Facility Diego Garcia, 4 December 2013. USN photo # 131204-N-IM705-017, by Mass Communication Specialist 3rd Class Laura Bailey courtesy of news.navy.mil. 285k Lt. j.g. Eric Filipowicz, assigned to the fast attack submarine Scranton (SSN-756), shares the "first kiss" with his wife as the ship arrives at Naval Base Point Loma, in her new homeport of San Diego on 21 November 2016. Scranton arrived after two years of extensive maintenance at Portsmouth Naval Shipyard in Kittery, Maine and three months operating at sea. USN photo # 161121-N-UK333-0148, by Petty Officer 1st Class Ronald Gutridge courtesy of news.navy.mil. 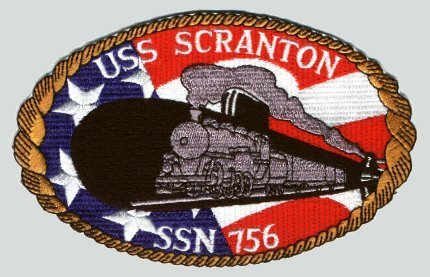 There is no DANFS History currently available for Scranton (SSN-756) at the Haze Gray & Underway, the main archive for the DANFS Online Project. 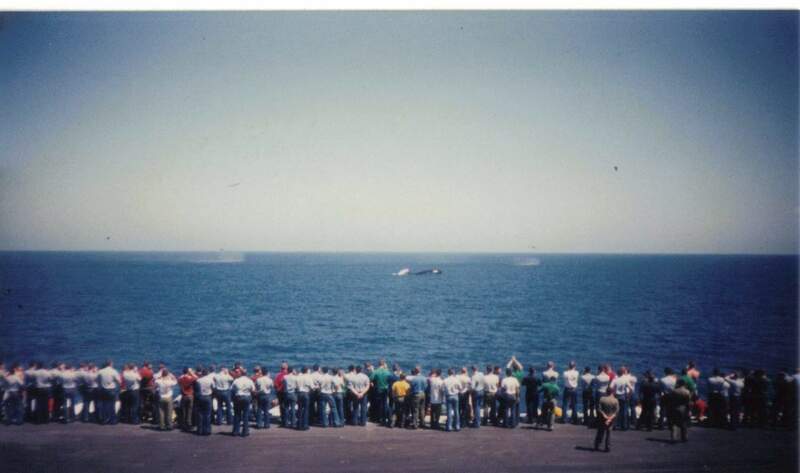 This page is created by Gary Priolo and maintained by Michael Mohl�1996 - 2019, NavSource History. All rights reserved.